Rattle-Snakes of this Size being differently marked and coloured from the large ones, as appear by the Figures, makes it generally concluded they are different, tho' this is not sufficient to prove it; for I have observed that some kinds change their Marks and Colours as they call off their Exuviae; others at the shedding of their Exuviae retain their Colours, particularly those that are of one Colour. This Observation I often proved, by assisting many of them to strip off their old Coats. Whether this little Rattle-Snake be of a different Species or not, must be left to future Enquiry. The Bite of this Snake is venomous, but it being small doth not always prove mortal. 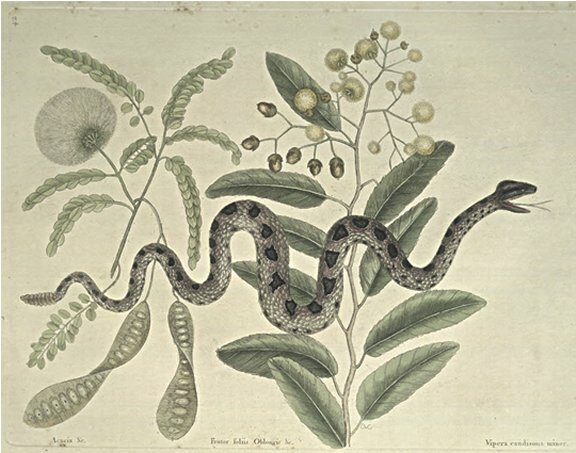 The Ground Colour of this Serpent is brown, shaded on the Back with red; along which are large black Spots, indented with a white Verge. All kinds of Serpents at mature Age retain their specifick Colours: It is while they are young and growing, that some of them are differently marked at the Change of their Exuviae, which I shall observe in their following Descriptions, so far as I know. The common Opinion is, that Rattle-Snakes have the same Number of Joints as they are Years old, which can be only conjectural, and seems to be a Mistake, for small Snakes have often more Joints than large. This Shrub grows usually to the Height of eight or ten Feet, with many tough Stalks growing in alternate bendings: The Leaves are berated, and grow alternately at the Angles of every bending: The Flowers grow in Spikes at the Ends of the smaller Branches, are pappous, globular, and sweet scented. The Fruit is about the Size of a large Pea, and shaped like an Acorn, except that the Cup is divided into four or five Sections. They grow on most of the Bahama Islands. These Trees grow very high, with large strait Trunks, some being above three feet Diameter, with very large spreading Limbs, the exterior Branches of the Tree are very small and pliant, thick set with pinnated Leaves. The Flowers are pappous, white and globular, and are succeeded by flat thin Pods, an Inch broad, and almost five long, and are usually twisted, inclosing many flat brown seeds. This is an excellent Wood, and next to what is here called Madera (which is the Mahogony of Jamaica) is the best Wood these Islands afford, much of it being brought from thence to England for Joiner's Work: The Grain is not altogether so close as that of the Madera, yet excels it in a variable shining, like watered Satin, and is mistakenly called Mahogony by the Bahamians.